Scrambling or climbing shrub, rarely a small tree. Leaves elliptic-oblong to ovate-lanceolate, 3-veined from the base, glabrous above, rough to the touch with stellate hairs beneath; margin finely and sharply dentate. Flowers in few-flowered terminal and leaf-opposed clusters, c. 3 cm in diameter. Sepals 1.2-2 cm, greenish and pubescent outside, white and glabrous inside. Petals shorter than the sepals, 5-9 mm, narrowly triangular. Fruit distinctly 4-lobed with long russet hairs between the lobes, reddish. Habitat: On the margins of evergreen forest, among rocks in high rainfall woodland or on termite hills. Worldwide distribution: Kenya, Tanzania, Uganda, Malawi, Mozambique, Zambia, Zimbabwe. Wild, H. (1963). Tiliaceae Flora Zambesiaca 2(1) Pages 57 - 58. Hyde, M.A., Wursten, B.T., Ballings, P. & Coates Palgrave, M. (2019). 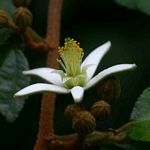 Flora of Mozambique: Species information: Grewia stolzii.